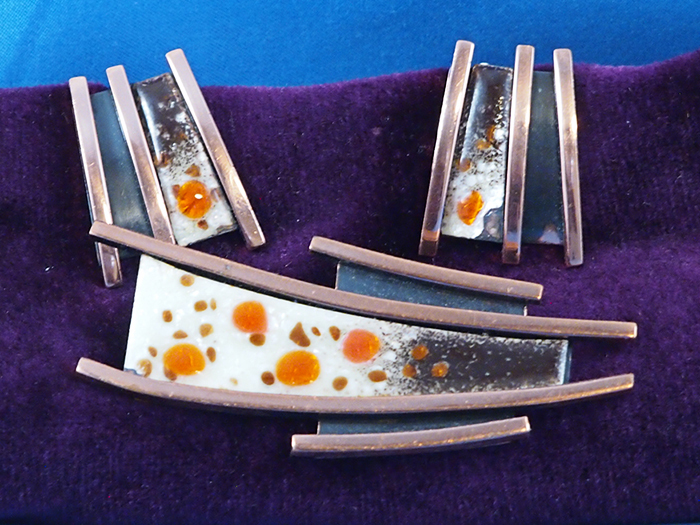 This vintage signed Matisse earring and pin brooch set, crafted from copper and enamel, is a good example of mid-century modernist and geometric design for which Matisse was noted. The earrings are clip on. The pin is 3 inches in length; the earrings are 1-1/4 inches. The set weighs 1.4 oz. This vintage signed Matisse bracelet is adorned with a coil design which extends across the piece. Matisse jewelry was produced from the mid-1940s to 1964, and was a favorite of many notable film stars of the time. 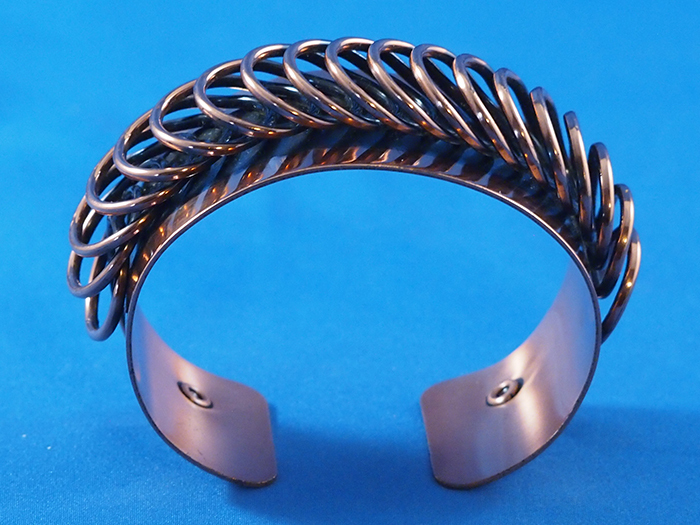 This bracelet is 2.5 inches in width and 1-1/4 inches deep. It weighs 1.8 oz. 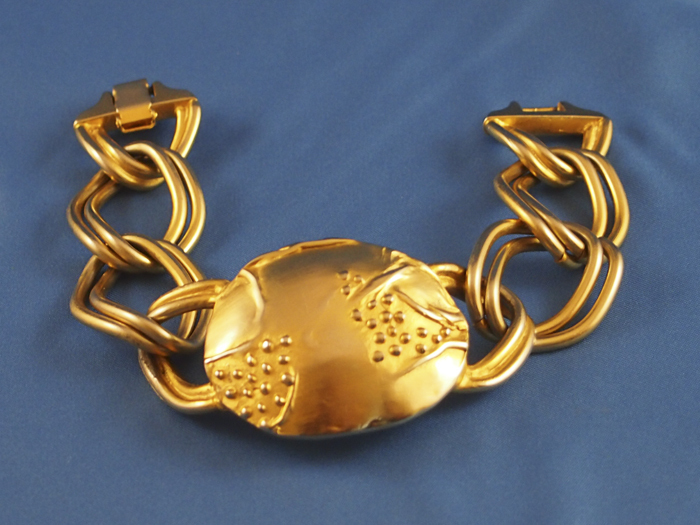 Vintage gold-toned bracelet by noted designer Kenneth Jay Lane. The bracelet has two double strand links on either side of a central shell which has the appearance of hammered gold foil. 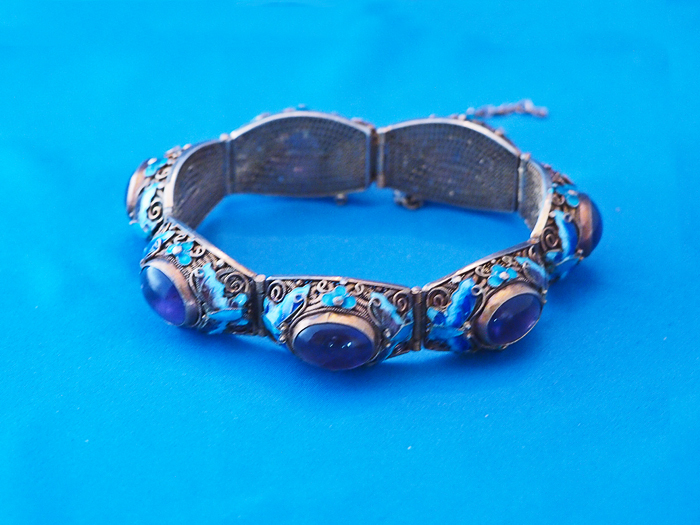 The bracelet has a traditional locking clasp. It is 7 inches in length and 2.0 ozs in weight. Inspired by an iconic Tiffany design, this 3-banded cocktail ring is sterling silver with seven princess cut garnet stones. The stones are 5mm x 5mm. The size 7 ½ ring has a weight of .7 oz. The center ring has 5 stones. 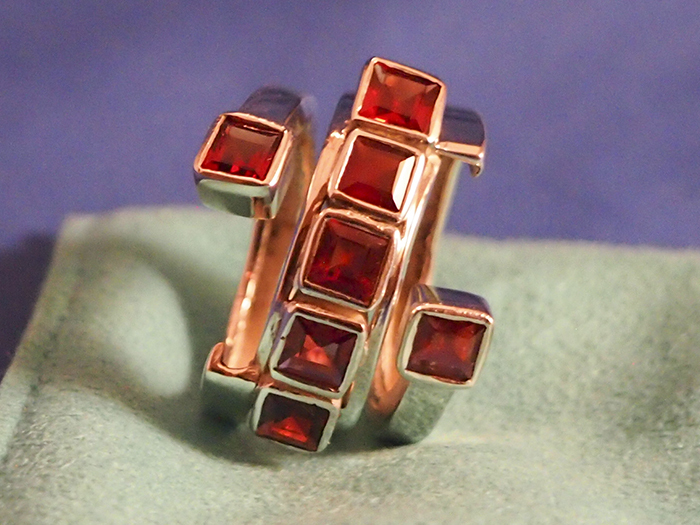 The outer rings each have one garnet stone. Vintage unsigned silver and turquoise ring. The ring features a leaf design and other traditional Native American elements. The ring weighs 13 grams (.46 oz) and is size 5 ½. The stone measures 25 mm x 20 mm. Beaded Tassel Earrings. 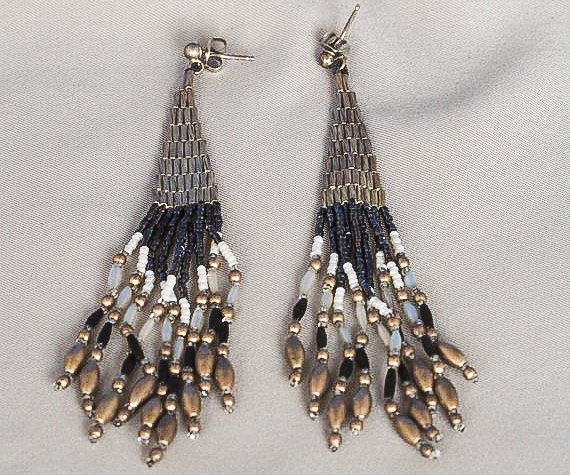 Flowing silver-themed earrings with delicate tiny beads of various shapes. The tassels are longest in the center and graduate to a shorter length at the ends. Beautiful and intricate craftsmanship. For pierced ears. The earrings are 2 inches in length and together weigh .3 oz.